Portable space heaters are a potential source of fire if not used properly. The requirements listed below, applicable code requirements, and manufacturer’s recommendations must be followed to maintain a safe environment. Contact Tufts Facilities Operations Desk to report the condition. If the installed system cannot be repaired in a timely manner, Facilities may recommend a temporary space heater meeting the requirements listed below. All heaters must be Underwriters Listed (UL) or Factory Mutual approved for their intended use. Heaters must have a thermostat to automatically shut down the unit when the desired temperature is achieved. Heaters must have a tip over automatic shut down feature. Heaters must be kept at least 3 feet (36 inches) from all combustible materials e.g. file cabinets, desks, trash cans, paper boxes, etc. Heaters need to be monitored daily. Those heaters missing guards, control knobs, feet, etc. must be taken out of service immediately and repaired by a competent person. 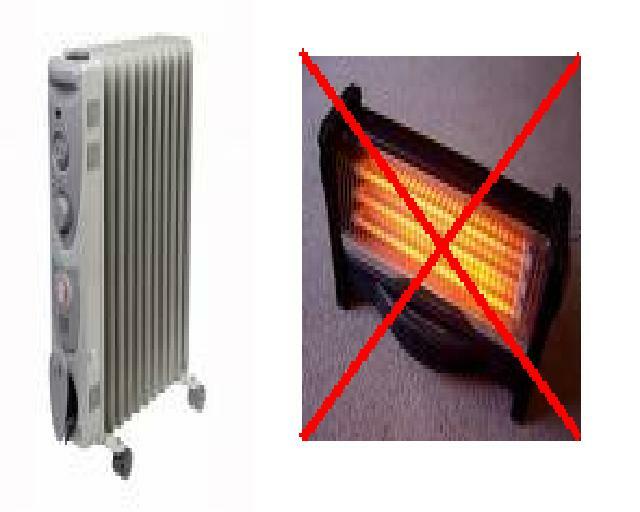 No open-coil space heaters are permitted in any university buildings. Space heaters of any type are prohibited in laboratories. No open coil space heaters are permitted in any university buildings. Space heaters of any type are prohibited in laboratories. If any of these conditions cannot be met, contact the Fire Marshal’s Office 617-627-3922 for assistance.